Shortly after he is elected president in South Africa’s first multi-racial election, Nelson Mandela (Freeman) tries to unite the apartheid-torn country using the efforts of the national rugby team, the Springboks, captained by Francois Pienaar (Damon), as a symbol. I personally didn’t see that strong a resemblance between Mandela and Freeman. Nonetheless, I began to buy into Invictus with the first shots of Freeman inserted into newsreel footage. Eastwood changed the odd detail for dramatic effect, but the most convincing detail was that the Springboks really did accept Mandela’s challenge and pull off an improbable and unifying victory. 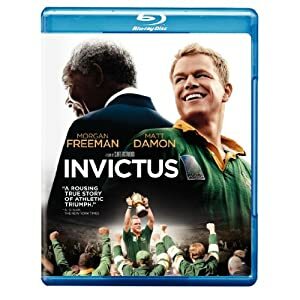 The Blu-ray disc includes an in-depth picture-in-picture mode, a featurette of Morgan Freeman meeting Nelson Mandela in preparation for the movie, a featurette of Eastwood looking back at his career, a featurette of Matt Damon’s rugby training, the Invictus movie trailer, and a digital copy of the movie.